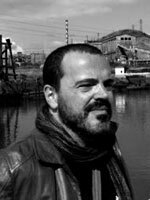 Txema Agiriano is a researcher and curator from the Basque Country. Now he lives in Gijón (Spain) where he is artistic director and curator of Espacio AVAart gallery. For 11 years he has been artistic director of MEM experimental arts international festival. He is also art critic. He has extensive experience internationally as a curator working for museums, institutes and galleries in Spain, Belgium, France, Daenemark, Turkey, USA, Germany, and more. The screening of project is splitted on four days.